The English Kindergarten Program runs 5 days a week for 3 years until children enter elementary school. Each day, children spend 4 to 6 hours studying as well as participating in outside play, physical exercise, music, craft and cooking in English only, to naturally develop their English ability like a native speaker. And fun events such as excursions, athletic meetings, field trips, Japanese and Western seasonal events are held throughout the year, with the aim of nurturing children with a global mind and a broad outlook through experiencing various cultures. We also have various activities such as art, ballet, hula dance, jazz dance and P.E. Because of small classes limited to eighteen children, teachers can understand each individual child well, praise each small achievement, nurture confidence and encourage children to truly express themselves. When you enroll from the preschool or pre-afternoon, please pay only the difference between the registration fee. 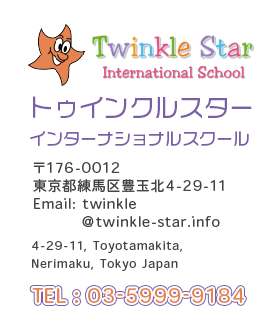 the amount for preschool students is 97,200 yen and Pre-afternoon students is 108,000yen. The entrance from K2 will be 108,000 yen and K3 will be 86,400 yen. Kindergarten’s tuition fee will be paid for the term. You will be charged 5,650 yen for the Year Book at the end of K-1 and K-2 school year. You will be charged 500～1,000 yen for excursion throughout the year. Sibling discount dose not apply to Kindergarten program. Copyright © 2017 Twinkle Star International All Rights Reserved.